The New Jersey Real Estate Salesperson Exam is split into two parts. The first part is the real estate salesperson national exam and the second part is the real estate salesperson state specific exam. 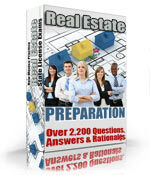 The national portion of the New Jersey Real Estate salesperson exam is comprised of 80 questions. In order to pass the exam an examinee must answer 56 out of the 80 questions correct to pass (70% correct). The time limit allowed to complete the total New Jersey Real Estate salesperson exam is 4 hours. The state specific part of the New Jersey Real Estate Salesperson Exam is comprised of 30 questions and an examinee must answer 21 questions correct to pass (70% correct). The time limit allowed for the total New Jersey Real Estate Salesperson Exam is 4 hours. Before registering for the New Jersey Salesperson exam you must first complete the education requirements. In New Jersey if you pass one part of the Real Estate Broker Exam you must retake both sections of the exam again. The New Jersey Real Estate Salesperson exams are taken by computer. The exam is closed book. You are permitted to bring a simple functioning calculator since 10% of the exam questions might involve math. The exam is scored immediately after finishing the exam. Remember to bring two forms of ID to the exam site, your exam confirmation code, any required course documentation, and two pencils. Thoroughly review the candidate handbook for the required items to take to the exam. Also arrive to the exam site at least 30 minutes before your scheduled exam time. The registration fee to take the New Jersey Real Estate salesperson exam is 60 dollars.